Typically, a fisherman just needs to worry about catching fish; they are the top predator. That’s not the case for longline fishermen in the Gulf of Alaska, however. Hungry sperm whales have learned over time how to remove the highly prized sablefish (which fetches an average ex-vessel price of $4.50/lb) from longline gear. The depredation of whales has inspired a unique collaboration of fishermen, scientists, and fishery managers to figure out ways to keep whales and the longline gear apart. The interaction between whales and commercial fishermen has not always been a concern. Years ago, sperm whales were relatively rare in the Gulf of Alaska, with populations still recovering from a century of industrial whaling. And even when whales started hanging around fishing boats off Southeast Alaska, at first they mostly ate the fish guts and heads that were thrown back into the ocean as the fish were cleaned. But over time, sperm whales got smarter and figured out how to pluck sablefish off longline hooks. As these interactions increased, catching fish got a lot harder for fishermen and the risk of injury to both fishermen and whales went up. To tackle these growing concerns, in 2003 commercial fishermen, biologists and fishery managers launched the Southeast Alaska Sperm Whale Avoidance Project (SEASWAP). As a founding member of SEASWAP, the Alaska Longline Fishermen’s Association (ALFA) and its members have worked closely with researchers to understand whale behavior near fishing boats and test whale deterrents. Through this research, 130 individual sperm whales have been identified; of those 130, 12-15 whales are classified as “serial depredators”—with the worst offender nicknamed Jack the Ripper. SEASWAP’s research found that whales had learned that the sound of a boat shifting in and out of gear means dinner is served, since longliners shift their engines in and out of gear as they haul their lines. 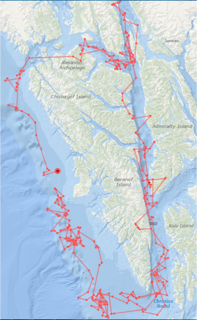 After testing a number of deterrents that helped but did not stop depredation, SEASWAP launched a sperm whale avoidance network, which allows fishermen to track whale location in real time and use this information to avoid whales. This year, ALFA was awarded a NOAA Bycatch Reduction Engineering Program grant to automate sperm whale location data sharing between SEASWAP boats, creating a network of fishermen working together to avoid sperm whales. This collaborative approach to addressing resource and management issues is at the core of ALFA’s work. Elizabeth Herendeen is based out of Southeast Alaska, where she works with nonprofits such as the Alaska Longline Fishermen’s Association and SalmonState to help protect and promote Alaska’s wild fisheries and fishing communities. ← Saltwater Anglers: Paying For Conservation? Sign up for email updates and action alerts. Fishing is a rich part of our American tradition. Fisheries policy and management can be highly technical, but at the heart of it lies stories of the men and women who make a living off of the last wild places, or who connect with nature, families, and communities through fishing recreationally and eating the bounties of the ocean. The Marine Fish Conservation Network is committed to ensuring that wild ocean fisheries are as much a part of our nation’s future as they are of its past. “From the Waterfront” shares stories of our fishing past, present, and future to demonstrate the invaluable role that healthy, well-managed fisheries play our American fishing tradition.